As we plan our homes and businesses on daily basis to enable us do all the necessary survival docking and diving within our meagre resources, governments equally do the same. One thing I have found out with our Governor, Chief Dr. Willie Obiano is SINCERITY OF PURPOSE to make life better for Ndi Anambra. Sincere to put in a transparent, working system that will enable the operations of governance to be accessible and reduction in overhead cost of administration. Sincere to improve the ecstatic of our capital city by improving the facilities within and around the capital neighbourhood, sincere to develop the areas of our economic strength to the level of being viable in serving our country and providing employment for the teeming unemployed youths in our State, sincere in securing our environment, identifying that a safe environment is a heaven for investors. All long term visions. What we do not consider is that all these laudable projects and ideas require serious injection of funds as to be realised. The big question is; WHERE WILL THE GOVERNMENT GET THE MONEY? It will be difficult for us to understand why the government cannot fulfil certain promises or expectations, the headache of how to resolve all these issues and more lie on the shoulders of the Governor and his Government. For the people that are aware, allocations to the States from the Federal have dropped drastically since the downward plunge of our oil in the international market. Commodity that was selling for over N100 per barrel sells for less than 50% of that price today. The allocations to the States are based on the sale of oil. Anambra State and indeed all the States in the Nation have been getting a lot less from the central purse, this is the main reason why some States are owing salaries for months and some for year plus now. Some are not just owing salaries, other projects in some of the States have been stopped entirely due to lack of funds. In Anambra, our Governor has continued to push on with projects, against all odds, has continued to pay salaries as at when due. Can we imagine the type of confusion such would have thrown us if our Civil Servants and Pensioners are not being paid, incessant strikes, abuse of government by all and general field day by the opposition. 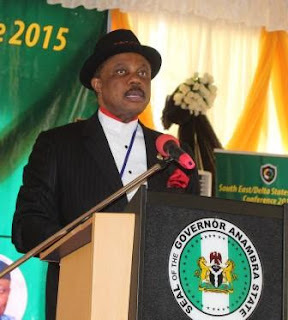 It takes God's wisdom to govern a complex State like Anambra and if you ask me candidly, I believe that God has blessed our Governor with Solomon's wisdom hence his ingenuity in keeping religiously with the obligation of paying wages recognising that times are hard and that the workers and the pensioners need to survive. When salaries are paid with the meagre resources available to government, what is left certainly will not be enough to carry out any meaningful project, the main reasons for electing him the first place. Will it really be ok for us if the Governor comes back to us for a second tenure on the mere premix of paying salaries? It will amount to gross irresponsibility of governance and abuse of our collective intelligence. How then do we expect the Government to perform, knowing also that the civil servants constitute a minor percentage of the generality of Ndi Anambra? It is then important that we collectively support the Governor and Government of our dear State by paying our taxes and dues. It may be hard on us at this time but it is a very important sacrifice from all of us in making sure that our State does not sink due to lack of funds. The opposition can say anything, but the reality of governance does not hang on their shoulders. Not too long ago, an opposition party promised all unemployed Nigerian youths stipends of five thousand naira monthly, today they are in power, what has happened to the promise?. This is the reason I compare governance with football fans sitting at the sideline, they always know wrongly better than the coaches and players. Akpokuo's genuine intensions for Ndi Anambra are clear from inception. Four points agenda; (1) Developing our Oil reserves (2) Creating enabling environment for Industrialisation (3) Creating enabling environment for Trade and Commerce (4) Encouraging agriculture. Ndi Anambra know that these four areas are our KEY areas of collective strength. The type of attention Governor Obiano has paid to our agricultural development so far has never been heard of in our history. He is doing these not just for us to produce for our consumption, but to become number one in food export in this nation. He wants Ndi Anambra to feed Nigeria and beyond. He wants our youths, instead of turning to crime, to see agriculture as a sure option for survival in this world of global unemployment. To develop agriculture is not just about setting up farms, we need to process, package and preserve, we need to have accessible roads to get these farm produces out, we need to provide the farm environments with all the necessities required for long term survival. If these things are not provided, these farms would end up being mere political gimmicks, waste of money and time. As Governor Obiano is doing in agriculture, he is doing same in the four cardinal areas of his government, Ndi Anambra, the State needs money, Akpokuo needs money to get these jobs done. Today we are safe as a people, thanks to the security initiatives of Governor Obiano. Security as we all know requires constant upgrading as to keep ahead of the criminals. Recently, our Governor organised a security summit involving the entire South East and Delta States in recognition that we can never really be safe when the criminals can always come in from these surrounding States, carry out their nefarious activities and run back to their safe heavens outside Anambra. What more actions do we expect of him to prove to us that he really cares for his people, all of us Ndi Anambra. Times are hard, but it could have been harder if God did not give us a caring, wise, committed and selfless Governor like Willie Obiano Willie is working is not a mantra for Willie Obiano but a clear statement to all Ndi Anambra that Willie our Governor is doing what we elected him to do with our money, we all are in this together. I plead with Ndi Anambra to reciprocate the commitment of our Governor by paying their taxes and dues, it is the only way we can hold him accountable if he does not deliver by the end of his tenure. Anambra is getting better on daily basis, it is due to our collective support to his government, please let us keep supporting him, these are the things that will give us better opportunities tomorrow, our children will fare well in an organised, safe and flourishing State.Let me quickly remind Ndi Anambra that there is no abandoned project in our State, the Governor is only prioritising due to limited funds, time will prove him right. I thank you all Ndi Anambra.